This example will demonstrate how to create a Virtual private Network (VPN) between two remote locations through the Internet. The VPN policy will use 3DES IPSec to securely send/receive encrypted data over the Internet. When the VPN tunnel is enabled, the two offices will virtually appear to be on the same local network. 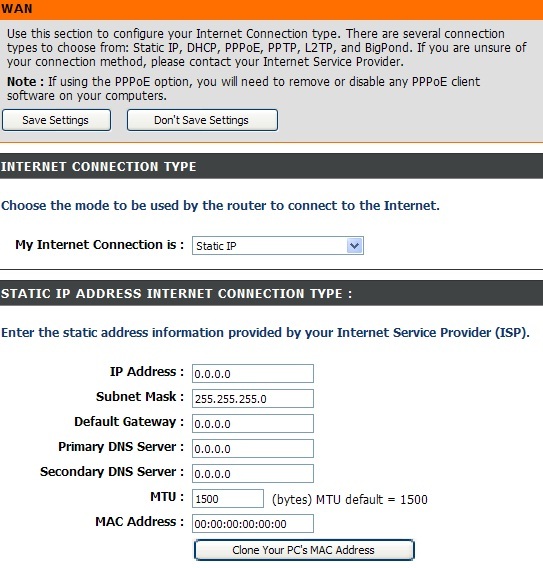 This example will consist of two DI-804HV VPN Routers with a simple setup. The two remote offices in this example will be known as Office A and Office B. Both VPN Routers must already be set up and able to access each other. 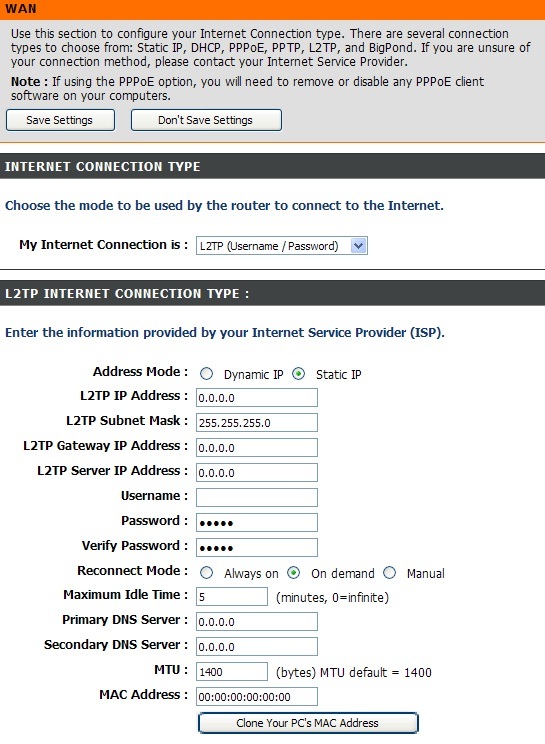 This is only an example, your setup will vary using the WAN IP address provided by your ISP. Please note the differences in the IP addresses for each office. We will begin by configuring the DI-804HV at Office A. 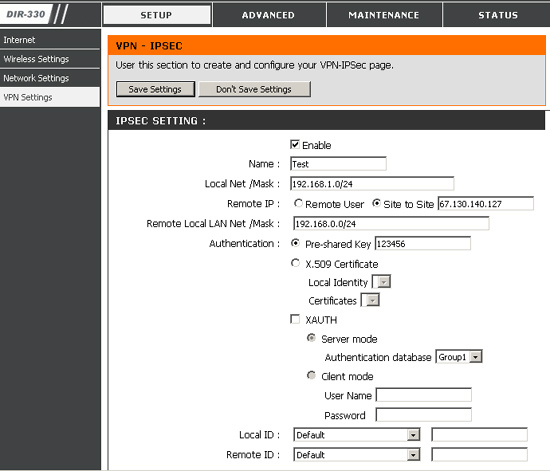 Start by going into VPN Settings under the Basic Setup menu. Step 1: In the Connection Name field, type in OfficeA. Click ADD. Step 3: Click SAVE. There should now be a VPN policy created for Office A. Now you will want to Save & Restart the DI-804HV. Note: PreShared Key must be the same on both routers. Office A setup is now complete, we will now configure Office B with the other DI-804HV, Follow the same steps previously with Ofice A to create a VPN policy. Step 1: Please change the appropriate information. Step 2: Click SAVE. There should now be a VPN policy created for Office B. Now you will want to Save & Restart the DI-804HV. After the VPN policies have been created for the two Offices, the two remote locations should authenticate and connect. To view the status of the VPN connection, go to the Device Status menu. On the bottom-left side of the menu, click on the VPN Status icon. A VPN Status pop-up screen will appear showing VPN connection status. If a VPN tunnel is active, the State should indicate Q-Estab. Go to a DOS prompt and ping the internal IP address of the remote network. How do I apply a VPN or AP License to the D-Link DWC-1000? Step 1: The D-Link DWC-1000 will need to be registered with D-Link. The registration site is http://register.dlink.com. Step 2: Once logged into the registration site, click on License Key Activation on the left. Step 3: The OBU and Customer fields cannot be changed on the License Activation page. Enter the Serial Number of the DWC-1000 that will have the license. Enter the 20 digit license key into the License Key field. ClickGet Activation Code to complete the registration, and you will receive an email within 24 hours containing your Activation Code. Step 4: Log into the setup page of the DWC-1000. Step 5: Click on the Tools tab, and select License on the left side. Step 6: Enter the received key in the Activation Code field. The DWC-1000 will show any applied licenses on this page. 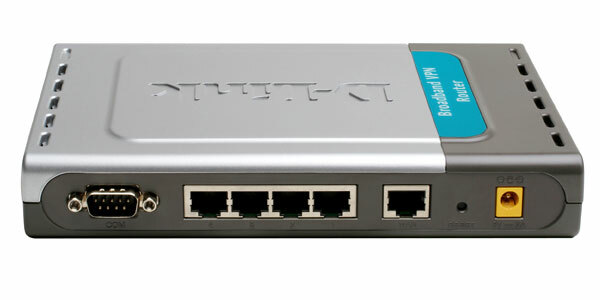 The DWC-1000 will support 1 VPN, and up to 3 AP6 licenses.